I have been working with contemporary patterns for a bit, although nothing ever seems to look current on me (the evidence may be found here, here, and here). So I decided that it was time to go vintage, and even further back in time than my current 1940s/1950s obsession, just to shake things up. Since I recently have discovered a love of the 1930s, I decided I should head even further back to the 1920s. And where does a project begin? With the fabric, of course! Well, not always, but for a bit of inspiration, I though it was as good a place as any. And here is a bit of my 1920s research. 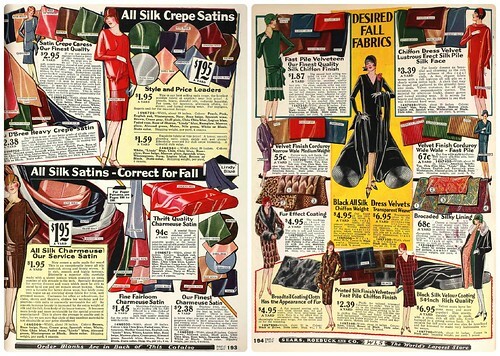 While I wish I could shop the Sears Roebuck catalog, this is mainly for fun and because my fabric has been chosen. I really am trying to be a good girl and use yardage from my stash, only purchasing extras like lining, thread, and buttons as needed. 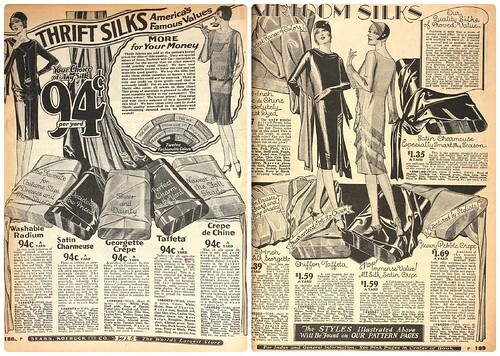 "Sheer and dainty crepe," "perfect charm by the yard" taffeta, and pages and pages of rayon and silk in the most beautiful colors and prints are what I found. Ginghams, florals, and abstract prints abound. Crepe de chine, velvets and velveteens, metal, and brocades. I can’t help but think of The Great Gatsby. Although the era may have been filled with conspicuous consumption, it sure made for some lovely textiles. And how about those incredible cocoon coats made of scrumptious patterned velvets? Not to mention all of those amazing hats! And I just love all of these patterns! 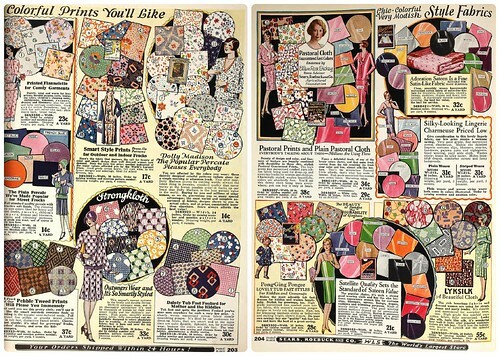 But for now, I am going to concentrate on the rayon on my sewing table and my vintage reproduction pattern. I love the 20's fashion, the colors and silhouettes, but with a body type which more belongs in the curvaceous 50's I haven't had courage enough to try any 20's style pattern (yet?). However I am sure that you will succeed in any project you take on so I eagerly await to see the result posted in this blog! I love the silhouettes of the twenties. I also like the political history - women taking on the establishment for the vote. The catalog is great. 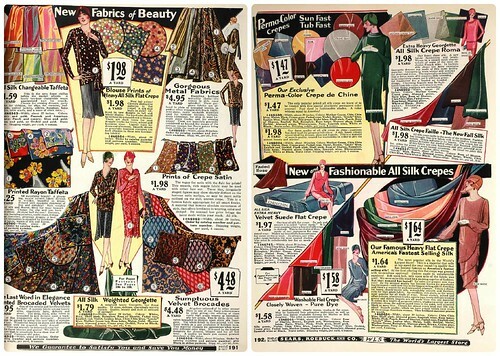 I could spend hours just admiring all the fabrics and styles available back then. Do you plan to make these without a pattern? How fantastically lovely! 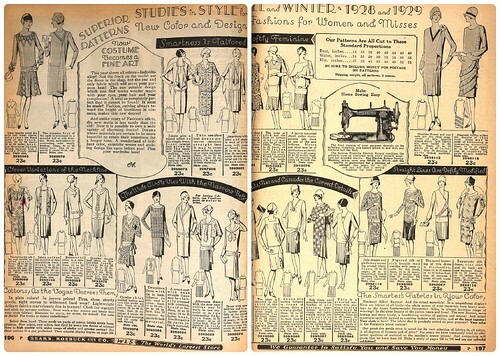 Though most of the fashions of the 20s don't work well on my petite, curvy figure, I still enjoy seeing them and would welcome the chance to try out some of these great vintage fabrics (if such a thing were possible) in looks from a couple of decades later. Wow, the prices on some of those fabrics are crazy high. But I guess we have fabrics now that are super special and pricey. 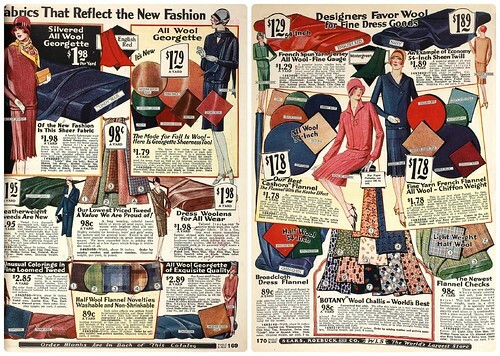 Thanks for posting - I love looking at old catalogs, especially from the 20s. 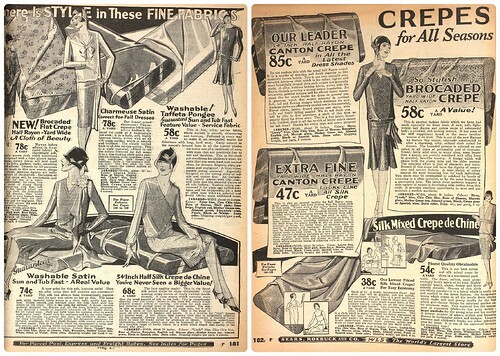 I love the twenties silhouettes but I can't wear anything from the twenties without looking like a shapeless potato, sadly. 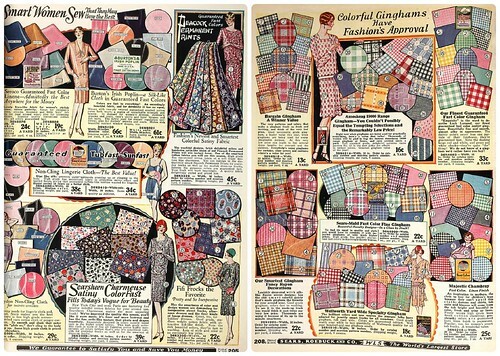 Nevertheless great fabrics! OOh I love these - I found some great french Marie Claire magazines and fashion magazines from the 20's and 30's when I was in Paris a few months ago. Hopefully I'll be able to scan them in and share too, I love seeing things like these!